Does the snowy weather just make you want to cuddle up and sit around the fireplace all day? 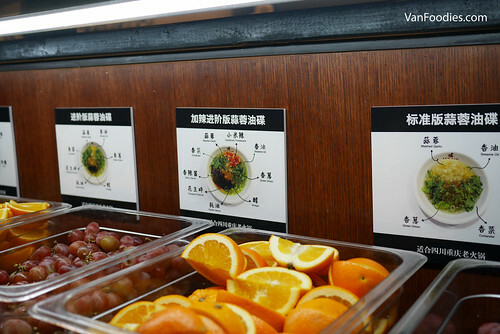 Us Chinese have another way to fight the cold weather — hotpot. While we usually have hotpot at home, we do go out for it sometimes. 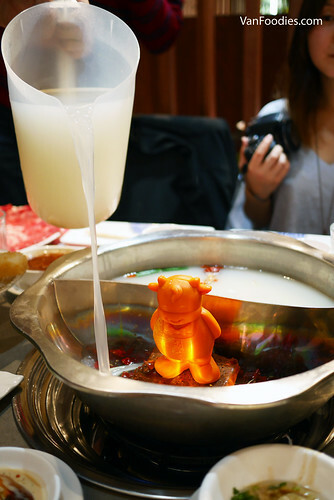 There are many hotpot places in Vancouver, with a mix of all-you-can-eat and a la carte options. Recently, I was invited to check out one of the a la carte hotpot places called Liuyishou Hotpot. It’s a worldwide chain, with a few locations in the Lower Mainland in Vancouver, Richmond and Burnaby. At the Burnaby location, one thing that caught my eyes right away was the Sauce Bar. It’s probably the largest in BC, if not Canada. 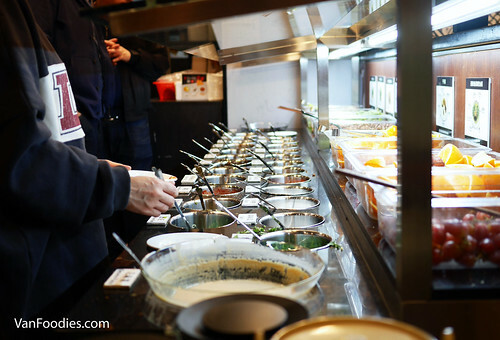 You can choose from minced garlic, cilantro and sesame oil, to mushroom paste, spiced vinegar and preserved bean curd. They have even posted some suggested “recipes” of sauces to pair with different soup bases they offer. Of course, the more important part is the menu items. Do they offer a lot of options? Are the ingredients fresh? Any interesting items worthy of note? Let’s break it down. First of all, the soup base. We had half and half Original Chongqing Spicy Soup and Special Pork Rib Soup. 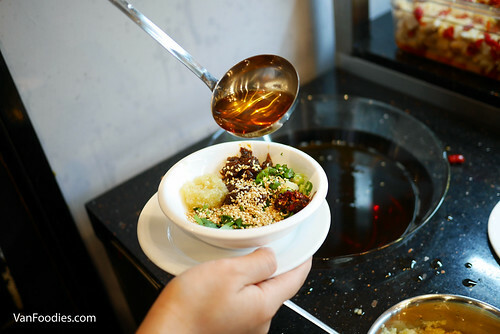 The spicy soup base was molded solid into a cattle shape, and it was melted down in front of our own eyes as the server poured hot broth into the pot. I was told that there’s no extra charge for the cattle shaped soup base, but there’s limited quantity everyday so it’s first come, first served.